Looking for the Plextor SSD cloning software? As the best SSD data migration tool, AOMEI Backupper allows you to clone OS to Plextor SSD without reinstalling Windows and applications. With time goes by, solid state drive (known as SSD) is gradually replacing the traditional hard drive (like HDDs). The SSD drive can meet the new demands of Windows users, like boot up within a few seconds, run a large game, quick response and so on. Thus, more and more Windows users consider using SSDs instead of HDD drives to promote the performance of computer. Plextor SSD drive is a well-known hard drive for computers, which provides a better capability than HDD drives. Plextor SSD drive owns these features: carry easily, no noise when working, and the faster speed of reading and writing. Why Clone OS from HDD to Plextor SSD? Considering these advantages, cloning OS from HDD to Plextor SSD is a wise choice to speed up computer. Transferring OS from HDD to SSD drive will much easier than reinstall Operating System; this operation can clone OS to Plextor SSD with all the system files, installed applications, users’ settings. Without the complicated operations of reinstall OS, you can save much more time to do your important job. Besides, you can also transfer data from HDD to SSD drive. So, when you get a brand new Plextor SSD drive, the first important thing is how to clone your current OS from HDD to Plextor SSD. How to Clone OS to Plextor SSD? Some brand of SSD offer the SSD data migration tool for its SSD, you can check for these tools on their websites or a CD/DVD along with the SSD disk. If there isn’t have one, you can search on the Internet for the Plextor SSD cloning software. Considering the uneven cloning software in the market, we’re going to introduce the best Plextor SSD cloning software - AOMEI Backupper Pro for Windows 10/8/7 users. Compared with other clone software, AOMEI Backupper is more reliable and flexible to use, which provides many advices for backup, clone, restore your important files, including disk clone, partition clone, system backup, disk backup, file backup etc. Following text is about how to clone OS to Plextor SSD drive. Step 1: Download Plextor SSD cloning software - AOMEI Backupper, install and launch it. On the main window, select “Clone” -> "System Clone". Step 2: Select the Plextor SSD drive as destination to save the OS from the source disk. Then hit “Next”. The AOMEI Backupper program will select the partition associated with system files automatically, you don’t have to select manually. If your Plextor SSD drive has data on it, the program will prompt you to backup the data first, because the data on Plextor SSD will be wiped out when the cloning operation finished. Step 3: In the next “Operation Summary” window, preview the operation and check “Align partition to optimize for SSD” option. Then click “Start Clone” to clone system to Plextor SSD drive. Tips: You can also tick the “Sector by sector clone” to clone all the sectors whether the sector is in use or not. You have to make sure the space on the Plextor SSD drive is larger than the capacity of source Partition, at least equal to the latter. Please make in mind, the time it takes will be longer. 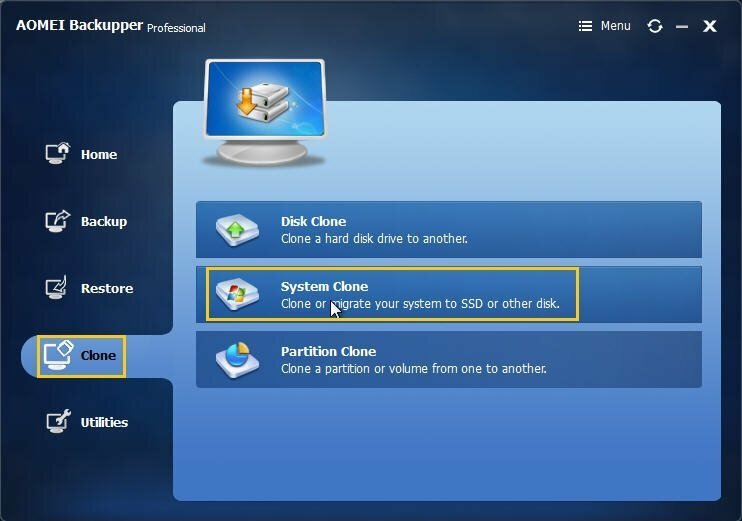 With the detailed instructions of the Plextor SSD cloning software, you can clone OS to Plextor SSD with ease. After the system cloning operation is finished, restart your computer; exchange the socket of source disk and destination disk to boot up properly from the Plextor SSD drive. If you want to clone your data partition to another hard drive, you can choose the “Partition Clone”.